Figure 1. Alkali Lake North. Google Earth image showing the location of RLC's placer mining claims, with the evaporation ponds of Albemarle Corporation's Silver Peak Lithium Operation to the lower left. 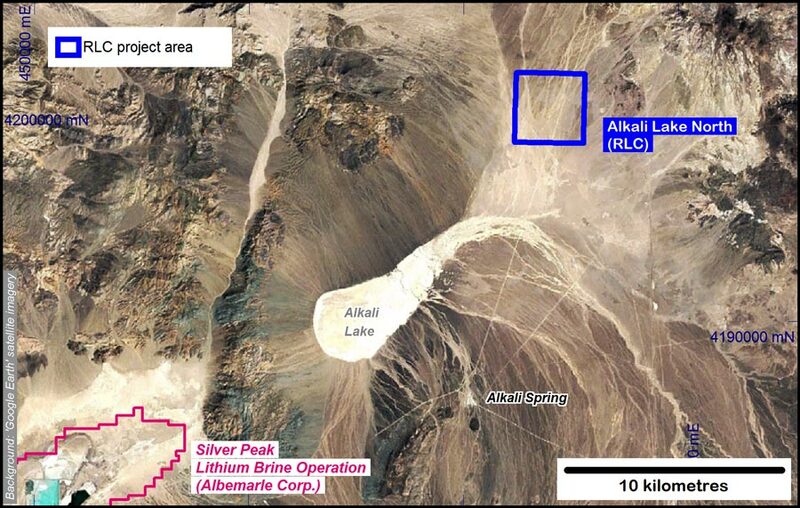 Alkali Lake North Project (Nevada, USA) covers part of a discrete sub basin located 30 kilometres northeast of Silver Peak and it occurs within an extensive 30 kilometres long, northwest trending basin that drains to the south towards Alkali Lake. Satellite and gravity imagery suggest that a deep basin is masked by recent alluvium. Several hot springs discharge alkaline salts onto the surface of the playa lake located 10 kilometres to the south west of the project area. Multiple brine aquifers within sediments over a vertical interval of more than 100 metres have been interpreted by the Company in 3-dimensional audio magnetotelluric (3D AMT) survey data (ASX release 28 August 2018 ).